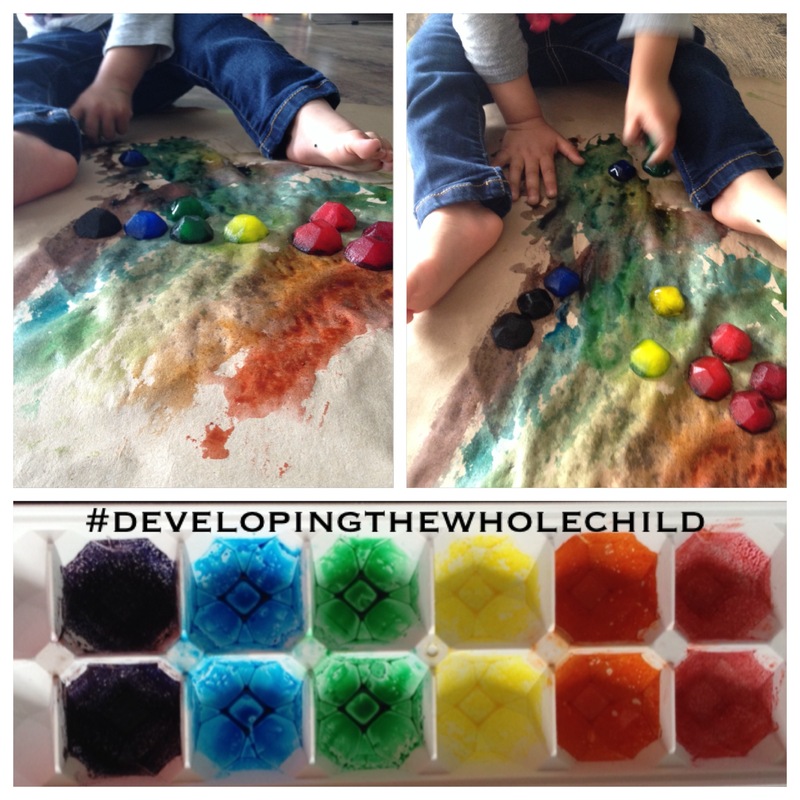 I added water and food colouring (you can also use liquid water colour to prevent staining) to an ice tray to make rainbow-coloured ice for a painting activity. I had seen a number of IG moms doing this activity, so I was excited to try it. R had a lot of fun rubbing the ice onto craft paper and between her fingers. We practiced the vocabulary word “cold” while doing this activity. Although food colouring stains fingers, it comes off after just a few washes. a. This makes a super fun activity for practicing colour naming and recognition with older kids. After having the child make a picture with the different colours of ice, ask him/her to point to each colour in turn as you ask him/her. b. Create a colour by number activity. Draw a picture with black permanent marker onto the craft paper and number different sections off. Ask the child to colour each section with the appropriate colour. For example, you might ask the child to paint every section that has the number one in it green and paint every section that has the number two in it red, etc. Hi Lili! This was super simple to put together and you don’t need much dish soap to make it. Hope your boys enjoy it! We just started playing with plain ice last week 🙂 Colors are much more fun!